WebSky India, with its base in Delhi is a web solutions company that has to offer utmost satisfaction to people who become its valued clients. We are experts in providing various services such as Website Designing, Website Development, Web Hosting Services, Search Engine Optimization (SEO), E-Commerce Solutions, Domain Solutions, Website Redesigning or Development, Content Management System, Brochure Designing and so on. We have employed a team of experts who are well-versed in their jobs and know how to get the best of the results, at the earliest possible hour. They can easily take care of any task without any kind of hassle. 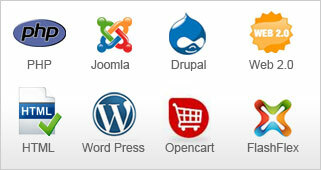 Our web designers, developers and SEO's know how to put into use the desired tools, be it designs or techniques, so that they can take your website to its highest level so that you can reap in benefits as soon as possible. The rates which are charged by us are quite affordable. After having a look at what your target, we devise a perfect solution for you. We make every effort to provide the best quality services as well as products. We not only design and development your website but also try and make sure that we will keep your business at its best raking in the search engines. Great work done in 3 days. Your team has created a professional–looking website and also done well on optimising it for search engines. It is ranking high in Google. I will recommend your service to others. Though the words are not enough for delivering work within the set deadline. We had not much time to wait long, as we had our urgent presentation, thank you for understanding our needs and Prioritizing our work. You people are best and creative in your job. I still cannot believe that with your support, my website is constructed within so many complications we had to face, and we wasted our so much money too, www.webskyindia.com helped us a lot to rebuild it professionally.